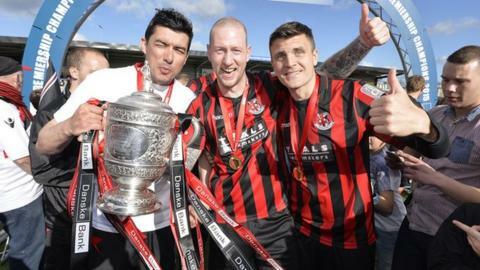 The BBC Sport website assesses the prospects for the new Irish Premiership season, with Crusaders setting out to retain the title they won so impressively last season and Carrick Rangers making their return to the top flight. Tommy Breslin's side have lost prolific marksman Joe Gormley to Peterborough and are still on the lookout for a replacement. Portadown forward Darren Murray has been on their radar but attempts to prise the ex-Donegal Celtic man to Solitude have so far proved unsuccessful. Jude Winchester requested to be put on the transfer list in June but skipper George McMullan has extended his stay at the north Belfast club by agreeing a new contract. Breslin has added Republic of Ireland youth goalkeeper Peter Burke to his squad for the new season. Improvement on a very disappointing fifth place finish for the former champions last time out is a must. Blues manager Warren Feeney will be under pressure to deliver the Gibson Cup after the club has finished runner-up in the Premiership for two successive seasons, one under his tenure. Former Glenavon striker Guy Bates has been added to the squad to provide further physical presence up front, while defender Mark Stafford and midfielder David Kee arrive from Ballinamallard United. All three were understood to be on the Windsor Park club's radar last year, but the south Belfast side have got their men this time around. Donegal Celtic's Danny Wallace has also been recruited. Linfield will hope to make more of an impact in the cup competitions, having underachieved in domestic knockout competitions in recent seasons. Crusaders eventually achieved the consistency necessary to win the league title, and ended up doing so in convincing fashion with 10 points to spare. Barry Molloy and Stephen O'Flynn are still finding their feet and full fitness after moving to Seaview in the January transfer window. Manager Stephen Baxter has further strengthened his squad by signing ex-Rangers midfielder Andy Mitchell, and forwards Michael Carvill and Jordan Forsythe, from Linfield and Bangor respectively. It would take a brave man to bet against the Crues retaining their crown but Baxter will highlight the fact that retaining the title is regarded as more difficult than winning it. The north Belfast outfit will need no greater incentive than trying to replicate the feat achieved by derby rivals Cliftonville in 2013 and 2014. The Glens confounded pre-season expectations again by winning the Irish Cup for the second time in three years and finishing in the top six ahead of the league split. Manager Eddie Patterson has his young, inexperienced side playing an attractive brand of football and qualification for the Europa League provided a much welcome financial boost for the cash-strapped East Belfast outfit. Fears that Patterson and midfielder Stephen McAlorum may leave the club in the summer have been allayed and the Glens boss has added Conor McMenamin and Kristian Gibson to his ranks. The return of David Howland after injury and a work placement is another significant boost. Another mid-table finish looks likely, but they may hope for more. The arrivals lounge at Shamrock Park has been unusually quiet this summer, but with a strong squad already assembled by manager Ronnie McFall, the mid-Ulster men will be expected to be to the fore at the top end of the Premiership table. The 2014-15 season ended in disappointment with defeat in a rain-lashed Irish Cup final at the Oval and the news that Darren Murray is keen to leave the club in favour of a switch to Cliftonville will have ruffled a few feathers. Ports boss McFall remains adamant that the player will remain at the club as he seeks to retain a squad capable of improving on last season's fourth position and making a serious challenge for the title. Oran Kearney will be under pressure to improve results at Ballycastle Road. Oran Kearney's position as Coleraine manager appears a little precarious after he was only handed a one-year extension to his contract after "careful consideration" by the Board at Ballycastle Road. The Bannsiders boss has, it is understood, agreed to a series of "clear and absolute objectives" for the forthcoming campaign, but will have veteran defender William Murphy at his side as part of his backroom team. Kearney will hope that forwards Rodney Brown and Sammy Morrow, signed from Linfield, will boost his side's attacking threat. with highly-rated Dergview left-back Garth Falconer bolstering the defensive options. Premiership survival will again be the name of the game for the Mallards, who have lost defender Mark Stafford and midfielder David Kee to long-time suitors Linfield. Manager Whitey Anderson must also plan without Stuart Hutchinson, who is unavailable for the new season because of work commitments. The arrivals of goalkeeper Alvin Rouse. influential midfielder Shane McCabe from Glenavon and ex-Institute forward Robbie Hume offer cause for optimism however for the Ferney Park faithful, who were ninth in the last campaign. Anderson has also snapped up Crusaders defender Emmet Friars on loan until the end of January. Ballymena have established a reputation as something of cup specialists under manager Glenn Ferguson, having followed up their County Antrim Shield success in November 2012 with appearances in Irish Cup and League Cup deciders, and then an Irish Cup semi-final in March. A top six league finish since the introduction of the league split still eludes the Sky Blues, with a poor defensive record and their renowned inconsistency blighting their efforts last term. Goalkeeper Alan Blayney and midfielder Nathan Hanley return for their second spells at the Showgrounds, along with fellow close season recruits Mark Magennis and Willie Faulkner. A run of seven consecutive victories at the tail end of last season saw the Lurgan Blues secure an outstanding third spot in the Premiership and a place in European competition. Northern Ireland international goalkeeper Jonny Tuffey has joined from Linfield, while attacking midfielder Andy Hall has been acquired from Bangor and teenage winger Joel Cooper from Ballyclare. Progress under manager Gary Hamilton has been gradual and the mid-Ulster outfit will have high hopes of another strong league finish and perhaps more silverware to add to their 2014 Irish Cup triumph. Dungannon left it relatively late to ensure their Premiership safety in the last campaign and will hope to ease their supporters' nerves by safeguarding their top-flight status at an earlier stage in 2015-16. Highly-rated midfielder Jamie Glackin provided the Stangmore Park club with a major boost by committing his immediate future to the club despite interest from a number of clubs, including Derry City. The arrival of diminutive winger Alan Teggart from Ballymena United should give the Swifts an added attacking spark, plus a potential specialist penalty taker. Manager Darren Murphy has also signed midfielder Paul McElroy. The news that much sought after forward Daniel Hughes was staying at Milltown will have been greeted warmly by Warrenpoint fans, who came dangerously close to relegation via the play-off last term. In the end, the County Down men edged out Bangor over two legs, but manager Barry Gray will be keen to avoid a repetition of that scenario this time round. Mark Clarke and Shane Dolan have arrived from Ards, with Gray also snapping up Armagh City striker Stephen Murray, plus Matthew Rooney, Jordan Dane and Nathan Murphy from Drogheda, PSNI and Dundalk respectively. Carrick Rangers return to the top flight of local football after a three-year absence, to provide representation for the East Antrim area once again. Survival will be their main priority and manager Gary Haveron has put a high emphasis on experience in his close season signings, with Joe McNeill arriving from Coleraine and Mark Surgenor being recruited from Ballymena United. Strike pairing Mark Miskimmin and Gary Browne join from Coleraine, while Chris Keenan boosts the Taylor's Avenue side's options between the posts and midfielder Barry Johnston comes in from Cliftonville.